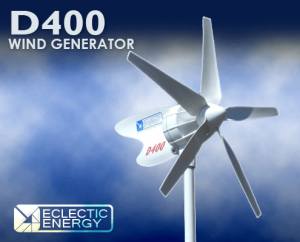 The D400 is extremely efficient by design, making it the most powerful and productive wind generator of its rotor size currently available. The D400 has been developed specifically to operate in close proximity to people. The noise and vibration usually associated with small wind turbines has been designed out of the D400. This has been achieved by making the turbine run relatively slowly for a given electrical output. In a given wind speed and a given electrical output, the D400 rotates at less than one quarter the speed of some competitor units. Combined with its rugged engineering and advanced computer-designed air blades, this makes the D400 the most reliable and benign turbine of its class currently available. The air blades are precision injection-moulded from glass reinforced nylon and as well as featuring taper and twist incorporate a special low-Reynolds airfoil section which varies continually in camber from tip to root. 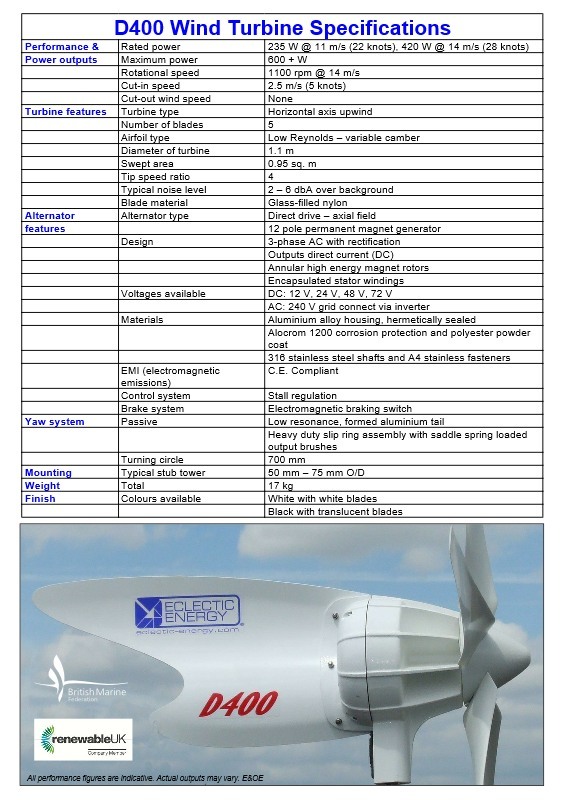 Because of the production method used, the blades are extremely consistent in terms of mass and can be replaced singly should damage occur without losing turbine balance. The alternator and yaw shafts are precision-ground from 316 grade stainless steel,and the D400’s body is a robust aluminium alloy casting. The bearings are high quality and generously sized, and are protected by twin-lipped radial shaft seals. The tail is formed from aluminium sheet into a shallow ‘S’ section in order to impart stiffness and prevent resonance. All aluminium parts are etched, alachromed and finished in a tough polyester powder coat. The D400 utilises a 12-pole, 3-phase axial field alternator of very high efficiency. It comprises two large annular magnet rotors with stator coils positioned in between. The stator coils themselves are wound from heavy gauge copper and are encapsulated in a heat-conductive resin. This in turn is bolted to a machined shelf within the aluminium housing, so ensuring excellent heat dissipation from the machine. Unlike typical wind generator alternators Eclectics Design is ironless which means that the alternator rotates completely freely without the cogging associated with conventional radial configurations. This means that when operating D400 is virtually vibration free and no mechanical noise is transmitted to the yachts cabin. A combination of the advanced air blade and alternator design delivers unparalleled efficiency in low wind speeds together with the ability to produce sustained high outputs in high winds. Eclectic Energy Ltd’s attention to design and quality should ensure your D400 gives years of trouble-free service. Please feel free to contact us if you require additional advice or guidance. 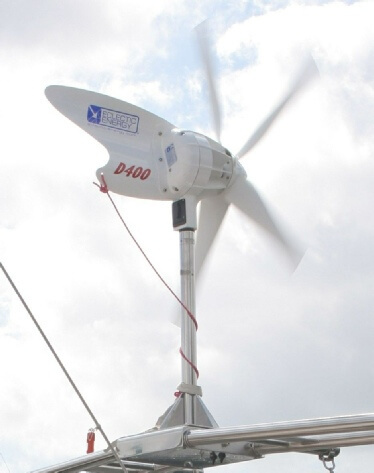 When mounting on a yacht or boat, positioning the turbine will be influenced by the configuration of the boat and other equipment fitted. It is important to ensure that the blades are at sufficient height such that injury to the crew from rotating blades is unlikely. A minimum height of the lowest point of the blades above a crewed area should be 2.4 metres. Also ensure that no part of the turbine can come into contact with any other part of the boat’s fittings or rigging. 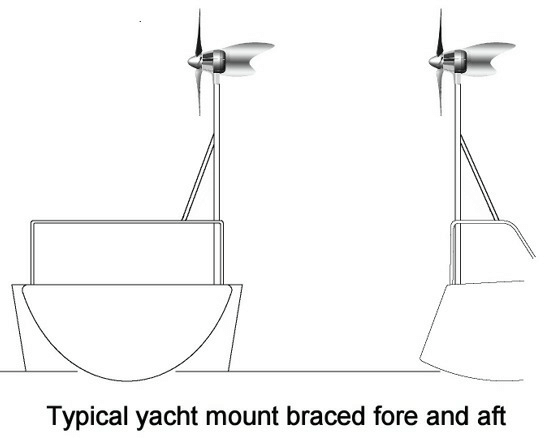 Because the turbine is subject to dynamic loads when the yacht is in a seaway in addition to wind loads, the tower should be securely braced or guyed both fore and aft and athwart ships. The bracing struts or wires should be firmly attached to the main tower at a point 200 –300 mm below the lowest point of the blades. The D400 is an inherently quiet and low vibration machine. However, certain applications may benefit from the introduction of anti-vibration mounts under the main tower and bracing struts. Note that, on a yacht or boat, no unsupported tower should exceed 2.5 metres in length. 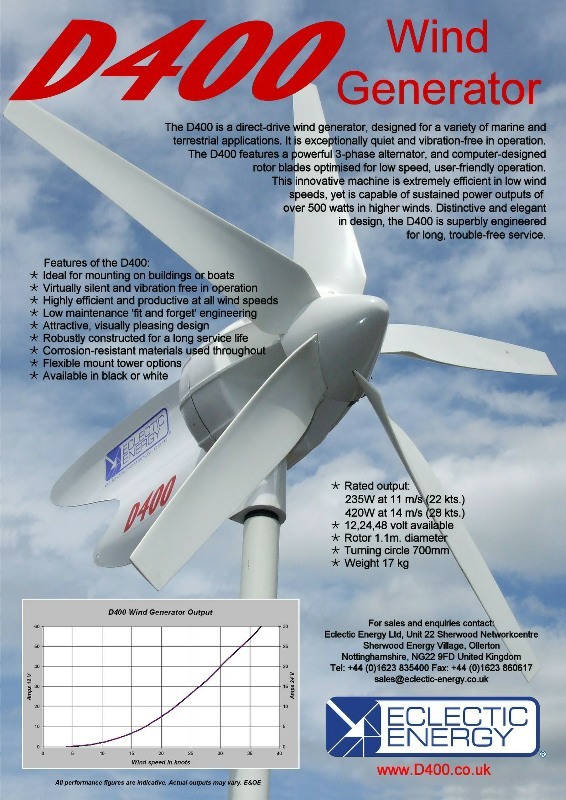 The wind loading on the D400’s rotor disc can exceed 50 kg, so any tower structure should be designed to allow for a safe working lateral load of 70 kg at the hub height of the turbine.